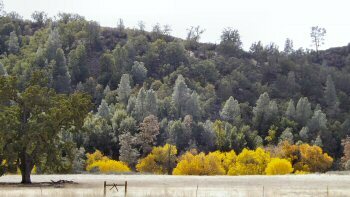 Central California Fall Color is certainly not the spectacular displays of the Northeast or the Midwest. The variety of trees is different as is the climate. However, there are beautiful displays to be found around the area if you know where to look. A previous Photo of the Week selection. 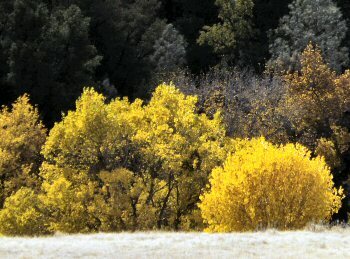 Due to the difference in the variety of trees and the climate, Central California fall color will never present a serious challenge to the great autumnal displays of New England. In fact, I don't ever recall reading an article pointing out the colors of the season here as a reason for visiting. But that doesn't mean that nothing ever happens here in the way of foliage displays. 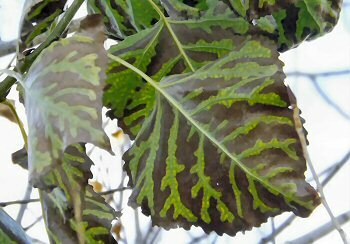 Other than ornamental varieties, the main performer in Central California foliage displays is the western cottonwood (populus fremontii) which is a member of the same family as poplars and aspens. "It (the Salinas River) was not a fine river at all, but it was the only one we had and so we boasted about it—how dangerous it was in a wet winter and how dry it was in a dry summer. You can boast about anything if it's all you have. Maybe the less you have, the more you are required to boast." So, with no less authority than John Steinbeck (but with much less verbal flair than he), I will boast of Central California's fall color and let you know where and when it might be seen. 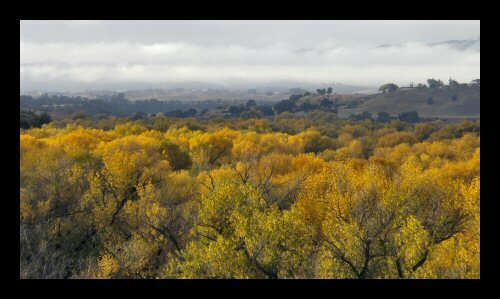 Cottonwoods are naturally found in river and creek bottoms throughout Central California. They thrive in this habitat. One of their attributes is that they are incredibly simple to propogate with cuttings, if it is done in the winter. That allows them to take advantage of the winter rains and flooding which will break off branches and carry them downstream where they will root and start anew. The photo at the top of the page was taken across the river from San Miguel, looking southward toward Paso Robles. As you can see, the river bottom is quite wide through here and hosts many thousands of cottonwoods. If you wish to see this display, the best route would be the aptly named River Road. River Road runs parallel to the river from Paso Robles north to San Miguel and is on the east bank where Highway 101 runs on the west bank through here. Another place to see the Salinas River from an elevated position is along Highway 101 between San Miguel and King City. Seeing the broad sweep of the cottonwoods in their fall color is nice through here. 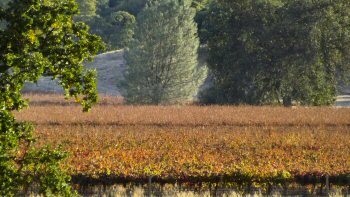 The thousands of acres of vineyards throughout Central California are yet another source of fall color. The colors aren't highly intense and seem to vary according to the variety of grape planted, but as you can see in the photo to the right it can be a lovely sight. The length of time that the vines spend going from green to dull brown is quite short. The colors that you see in this photo might last 4-5 days at the most. So you wouldn't plan a vacation to Central California around the theme of "fall color", but that doesn't mean it can't be an interesting part of your Autumn trip here. My point is really to draw your attention to the "minor" fall color displays of the area so you don't miss them on your way to other attractions. Just a "be on the lookout" reminder that hopefully makes your getaway or vacation here more enjoyable.